In a large skillet over medium heat, add sliced jalapeno and neutral oil. Cook for 1 minute until peppers start to soften. Add ketchup, bourbon, brown sugar and water to the skillet and stir to combine. Add in mini hot dogs and bring to a simmer. Turn heat down to Low and cook for 10-15 minutes, stirring regularly to let some of the alcohol cook off. 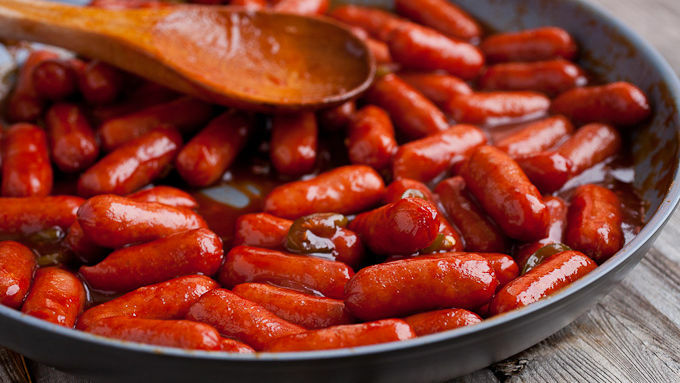 Transfer hot dogs and sauce to a small slow-cooker and keep warm over low heat. Serve with toothpicks! You can serve the hot dogs right out of the skillet, but just remember to simmer the sauce or it will taste like alcohol. 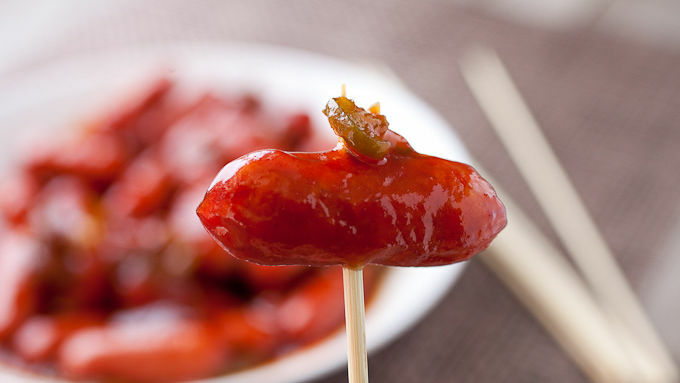 A quick and tasty appetizer with slow-simmered mini hot dogs in a slightly sweet and tangy bourbon sauce. It’s National Hot Dog Day! To be completely honest, I didn’t even know hot dogs had an official day. I sort of thought every day in the summer was hot dog day! 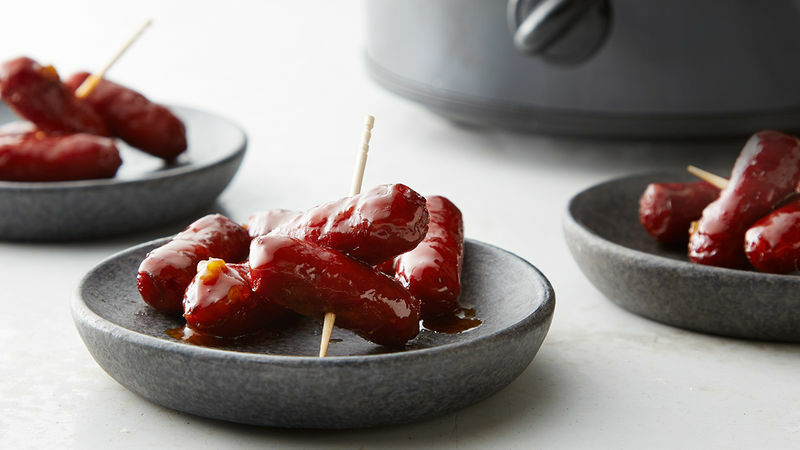 But since they do have a day, let’s celebrate with a mini version of hot dogs that are slow-simmered in a slightly sweet and tangy bourbon sauce. If you can’t find the mini hot dogs, you can also just chop up normal sized hot dogs and use those. There are only a few ingredients for this dish. Obviously you’ll need some hot dogs and some peppers. The jalapeño is optional, but I like that it adds a little spice to the appetizer. While you could toss all the ingredients in a slow cooker, I actually like to start them in a skillet to cook off some of the alcohol in the bourbon. 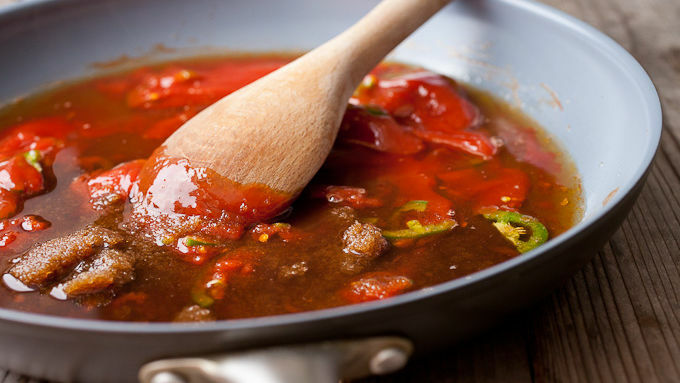 If the skillet gets too dry, you can add a little splash of water to bring the sauce back to life. When the sauce is thick and simmered down, you can transfer everything to a slow cooker to keep them warm over Low heat. You can serve the hot dogs right out of the skillet, but just remember to simmer the sauce or it will taste like alcohol. All you need for serving is a handful of toothpicks. Spicy. Bourbon. Hot dogs. Hard to say no to that idea!